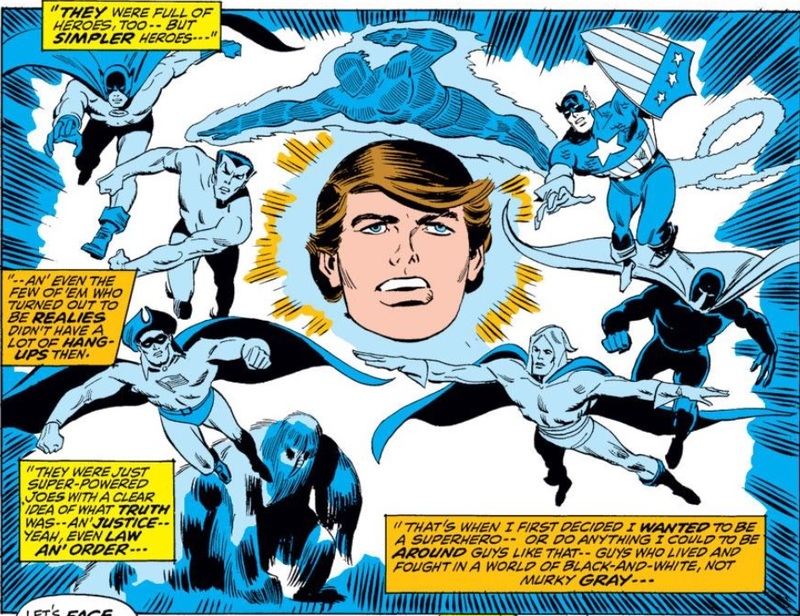 The Heap made an unofficial cameo appearance in Avengers #92 (cover dated September 1971), in which Roy Thomas foreshadowed the conclusion of the Kree-Skrull War by having Rick Jones think about various Golden Age characters. The Story: The airplane carrying pilot Paul Rodman, Matt Cable, Abigail Arcane, and Swamp Thing (the latter clinging to the wing) crashes in Scotland. Locals with a horse and cart take the three humans to a nearby gothic mansion. Paul goes out for one of those “middle of the night airplane damage assessments” that one does, and his body is found shortly thereafter, horribly mauled. And the manor folk won’t let Matt and Abigail leave, claiming that their only horse ran off. Riiiiight. Matt and Abby sneak onto the moor that night and are attacked by a werewolf. Thankfully, Swamp Thing has been hanging around to rescue them. They don’t see him, alas, but they flee back to the mansion, where they are drugged. Matt is going to be the victim of a full body blood transfusion, switching blood with Ian McCobb, the young laird of the manse, who is of course the werewolf. But Ian has a change of heart and wolfs out before the transfusion begins. Once again Swamp Thing bursts in to save the day, killing the werewolf this time. My Two Cents: The Latin word for swamp is “palus,” so I dub this sort of story “Deus ex palo.” The human characters face some sort of threat beyond their abilities to combat, and periodically Swamp Thing shows up to save their hides, then shamble off into the darkness. It happens twice this issue (just like on an episode of TV’s “The Incredible Hulk”!) and I bet we’ll have more examples soon. The “reciprocal transformation” element of the plot is the same as in issue #2, except it’s Ian and Matt trading “monster and human” instead of Swamp Thing and Arcane. Wein finds a good excuse to tell another gothic story, despite the 1973 setting. The isolated Scottish manor has no phone, no (electric) light, no motorcar—not a single luxury. Wrightson gives us one really cool shot of moonlight coming through a huge window with many small panes. Tres moody. Abigail’s presence was incidental; Matt Cable was cast as the damsel in distress this time around. Once again Cable shows his fanatical desire to catch Swamp Thing, to the total neglect of the nefarious guys he should be looking for. 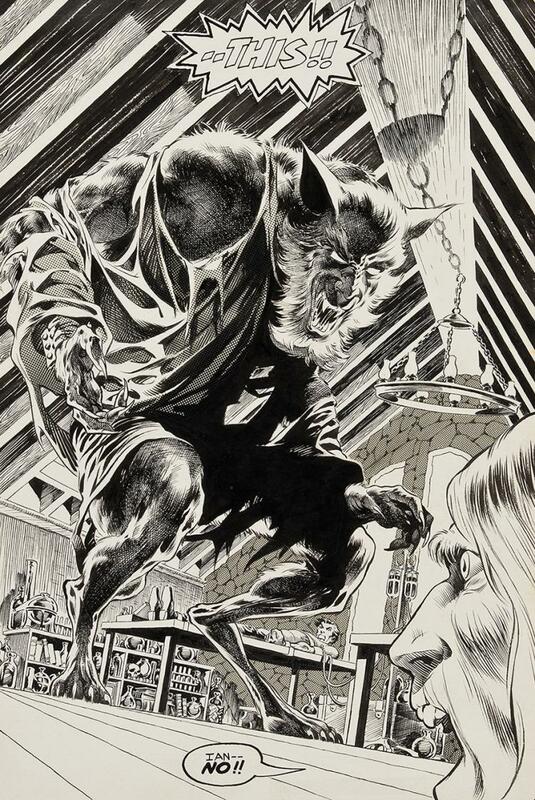 #4 had another great splash page with Wrightson's incredible werewolf. Taken out of context, that image suggests a whole 'nother story; one about owning a pet and cleaning up after them! 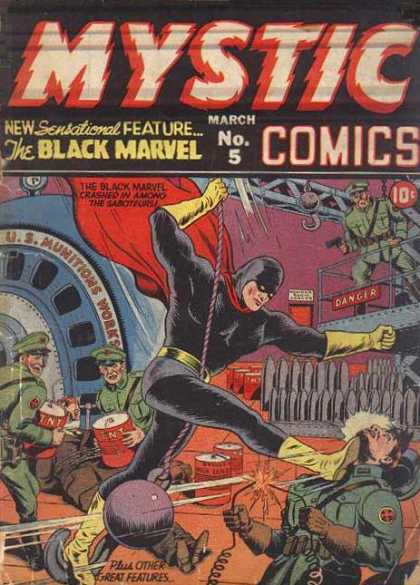 GCD says it's Centaur Comics' Fantoman, but you could be correct. The Story: Swamp Thing washes ashore in Divinity, Maine and meets siblings Rebecca and Timothy Ravenwind, who are surprisingly unperturbed by his appearance. The peg-legged zealot Gideon leads a mob in pursuit of them. Swamp Thing gets his arm lopped off by a scythe before he falls off a cliff into the sea. Rebecca is put on trial, in which the damning charges against her include “keeps to herself” and “talks at animals” and “has a productive garden,” all of which puts her in company with approximately 90% of the farmers of America. Gideon comes from a line of maimed men, all with a deformed left leg, including himself and his own son, and he is convinced that Rebecca’s death will mean the end of the misshapen babies. Swamp thing is surprised to find his own amputated limb regrowing rapidly. He breaks Timothy out of jail, then rescues Rebecca from burning at the stake. When the mob goes berserk, the Ravenwinds pull out a few tricks of their own, including an instant thunderstorm and the transmogrification of the townspeople into a pile of flowers. Turns out that Timothy is the source of the magic power, but Rebecca has the ability to focus and wield it through herself. Together, they’re a formidable brother/sister combo, like Fenris or Northstar/Aurora. My Two Cents: It’s a “science vs superstition” witch trial issue. Gideon is wrong that his family’s deformity is due to witchcraft; it’s probably genetic. But the plot twist is that he’s right that the Ravenwinds are witches. But then the second plot twist is that Timothy is the witch, not Rebecca. All in all, another gothic story with angry villagers wielding scythes and pitchforks and burning brands; not a firearm in sight. Swamp Thing’s involvement in the tale is once more Deus ex palo on two occasions. Timothy Ravenwind will not reappear until Grant Morrison’s Seven Soldiers: Zatanna #1. Swamp Thing's amputated arm will reappear in issue #19. A good story, but I remember after reading it the first time going back to the beginning because I felt I missed a reference to Swamp Thing somehow being transported 150 years into the past. Even in Maine, witch burnings were pretty well a thing of the past by '73. The same held true for that pitchfork-wielding German mob who wanted to put a stake through Nightcrawler's heart over in the X-Men! (Ditto for sword-wielding ninjas in Japan, I would surmise). They're not stereotypes... They're archetypes! Someone owes Liefeld an apology. At least they give a logical reason for his feet disappearing. Looks like Leo Gorcey's ready to bean him with that wrench. 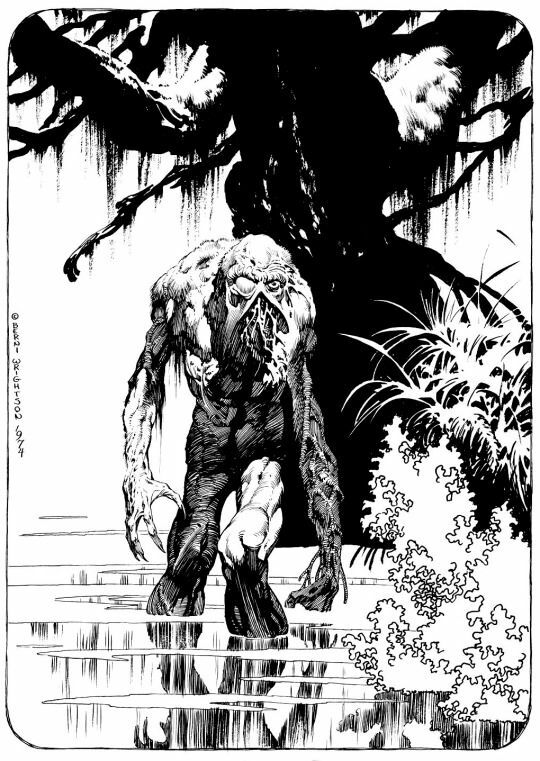 So you have to wonder: was Wein genius enough to know that having everything set in a swamp put a big limit on Swampy inter-acting with others and being part of the DCU or was he actually writing to the artistic strength of Wrightson so he would remain interested/involved in the series and continue? Either way, it seems to have worked out well as their run is so classic and endures while continuing to be reprinted many times over. 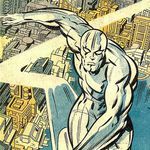 Their run more than any other seems to capture new readers interest with every reprinting. Well apart from Batman, he didn't do much interacting with the DCU while he was gone. And I think the Hawkman teamup in the unpublished Redondo issue was in the swamp, so I don't think that was it. Again, it was an excuse to let Wrightson draw horror themes (and Batman).